This century has seen continued exponential growth in the use of digital technologies. 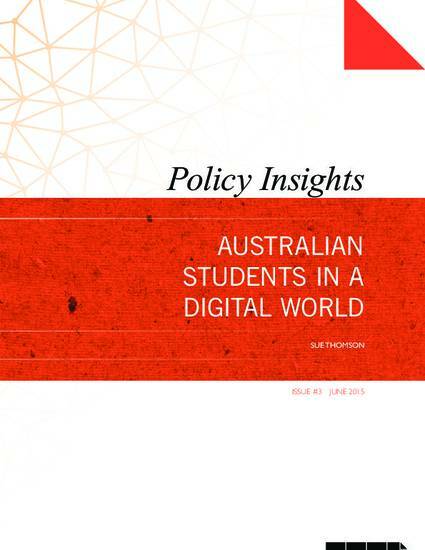 In Australia, the proportion of students having access to a computer at home rose from about 91 per cent in 2000 to over 99 per cent in 2013, and access to the internet grew from 67 per cent in 2000 to 98 per cent in 2013. According to the 2013 report on the International Association for the Evaluation of Education Achievement’s (IEA) International Computer and Information Literacy Study (ICILS), Australia had the highest percentage of students who used computers at school at least once a week (81%), while 87 per cent reported using their home computers at least once a week. However there was a great deal of variation in these proportions between different groups of students. The 2008 Melbourne Declaration on Educational Goals for Young Australians stated: In this digital age, young people need to be highly skilled in the use of ICT. While schools already employ these technologies in learning, there is a need to increase their effectiveness significantly over the next decade. Despite the strong growth in the use of digital technologies, there are claims that Australia is falling behind, with other countries including higher level computing activities in the curriculum at a much younger age than in Australia. This paper examines progress towards the goals of the Melbourne Declaration and presents a picture of ICT learning in Australia using information available from the International Computer and Information Literacy Study (ICILS) developed by the International Association for the Evaluation of Educational Achievement and the National Assessment Program - ICT Literacy (Australian Curriculum Assessment and Reporting Authority, and considers implications for policy.